The charred body of Shantee Nakhid, 24, was found inside a trash bag Tuesday morning. 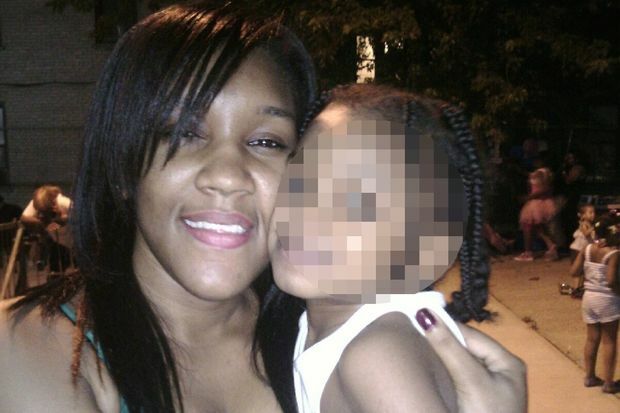 HARLEM — The mother of the woman whose burned body was found in a trash bag inside the DeWitt Clinton Houses Tuesday tried desperately to find her missing daughter — before a chance encounter with police led her to the grim discovery that she had been murdered. Estalita Edwards, 41, said she sent about 30 unanswered text messages to her daughter Shantee “Mookie” Nakhid, 24, when Nakhid didn’t come home Tuesday morning after leaving her grandmother’s apartment at the King Towers about 1 a.m.
Edwards said police also came to her house, but told her she had to wait until 1 a.m. Wednesday — 24 hours after Nakhid vanished — to file a missing persons report. The mother said that after worrying about Nakhid all day, she decided to return to her apartment in East Harlem about 7:30 p.m.
On her way home, she spotted a police cruiser with a high-ranking officer inside. “I stopped the car and asked him what the next step I’d have to take is,” Edwards recalled. “He asked me if I knew what she had on. I said she had on Uptowns and a floral-print peacoat and a black hat. I said, ‘Wait a minute, I have a picture of her on my phone.’ He looked at the picture and went around to the car to the other cop inside and told me to hold on. He said he was going to run her name in his phone. A detective immediately came downstairs to meet Edwards. “He told me to tell him about my daughter,” she recounted, with tears streaming down her face. Police believe Nelson Quinones set Nakhid’s body on fire in a building across the street before slitting his throat and wrists in a failed suicide attempt inside the DeWitt Clinton Houses on Park Avenue near 105th Street Tuesday about 6:30 a.m.
Edwards said she regularly talked to her daughter about her personal life, but had never met Quinones and never heard her daughter mention him. She said her daughter, a nursing student at Long Island University-Brooklyn, leaves behind a 10-month-old son and that Quinones was not the father. “My baby was a beautiful person. She was a great person, thoughtful and respectful,” Edwards said.